The whole article is full of amazing insights. i’s are not dotted or t’s crossed. Many papers remain to be written. Keynes’s point, though, was that this was a dodge to deal with the radical uncertainty he believed truly governed our knowledge of the (distant) future. I wish I knew more Bayesian statistics because I get a sense that the inability to assign probabilities to those events are a frequentist restriction, but maybe there’s still something in the Bayesian realm that can separate “risk” and “uncertainty” in a similar way. Keynes is absolutely not a frequentist – he believes in something of a third school which is spelled out in his (earlier) book on probability. And of course the critical nature of the distinction between risk and uncertainty above is not original to Keynes – there is a reason we call it “Knightian Uncertainty” after his colleague. 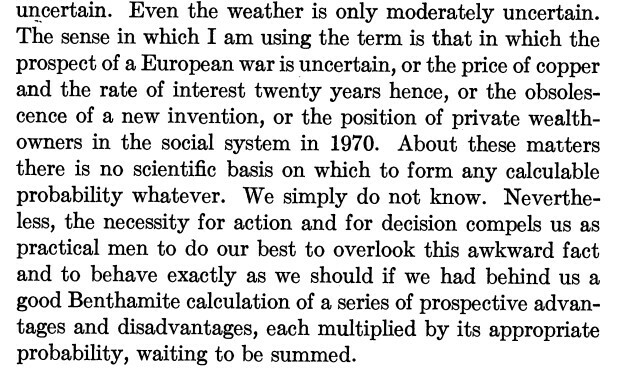 I’m curious what Keynes would think of something like action on global warming. He’s dogmatic in the General Theory when discussing government’s inability to plan for the long-range future. You actually see a lot of influence from the Austrians on these points. Yes, Knightian uncertainty or now Ellsberg Ambiguity are formalizations of uncertainty as a pose to risk. But Knight was at Chicago and Keynes at Cambridge U.K. They weren’t colleagues?! The day after I read this post about how Keynes thinks of money holding as a measure of the degree of our disquietude, a clearing house raises deposit demands for trading Italy-related securities and among several news and analysis reported on Bloomberg today, one of them particularly caught my eye (sadly they updated the news several times and I can’t figure out which link I should post here). When asked to comment on why clearing house wants to hold more cash to do anything with Italian security, an hedge fund manager explains: well it is not that simply the volatility increased, right now with this political gridlock in Italy “we simply do not know” what is going to happen. The quotation marks added to emphasize the exact statement that appears in Keynes’ text.